So Wearing KKK Hoods Is Now Considered an Appropriate Way to Show School Spirit?!?!? So let me get this straight, Trayvon Martin can’t wear a hoodie in the rain for fear of being considered a ‘thug,’ but it’s perfectly okay for some white kids in North Dakota to don Ku Klux Klan hoods in support of their school at a hockey game? A college student was attending the state tournament semifinal game between Davies High School of Fargo and Red River High School when he noticed the three fans wearing the pointed white hoods. I thought, 'Are those KKK hoods?' I couldn't believe it," said Shane Schuster, a 19-year-old who snapped a photo of the Red River fans with his cellphone's camera and then tweeted it. "I was shocked." After high school and tournament officials were informed of the incident, the hoods were removed by the second period. "After confirming the incident, we notified the administrators at Red River High School, who immediately began their investigation," Mark Rerick, Grand Forks Public Schools athletic director, said in a statement emailed to the Associated Press. "To the best of my knowledge, the students have been identified by the Red River administrators, who are continuing their investigation." 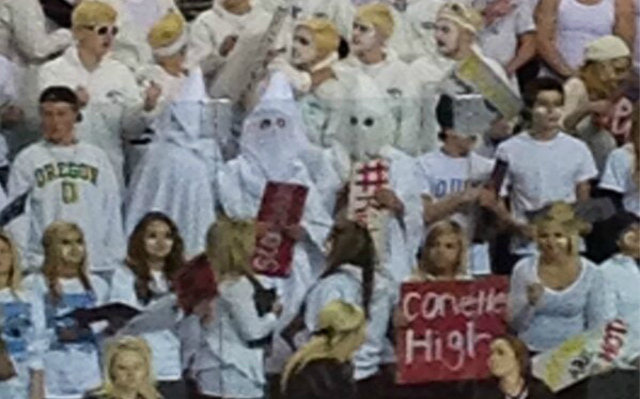 I guess only at a hockey game could a person feel comfortable rocking a KKK hood. I guarantee you would never see that type of thing at a football or basketball game. smh, what were the kids thinking? what point were they trying to make?